Horror Films Had Their Best Year Ever. Must Be Nice. Image and screengrabs via Warner Bros. / Universal / Warner Bros.
Everything in the world has seemed more terrifying in the past few hundred days, so of course it makes sense that 2017 would be the highest grossing year in the history of horror films. When Jordan Peele’s Get Out was released—either in February or 200 years ago—I only had two gray hairs. Now, I have several. That film swiftly took over and, since then, horror movies have made a KILLING lol at the box office, including the IT refurbish (which became the highest grossing horror film of all time), Happy Death Day, and well-received horror films like Annabelle: Creation, It Comes at Night and Raw. Scary movies have collected $733 million in ticket sales, according to the website Box Office Mojo. 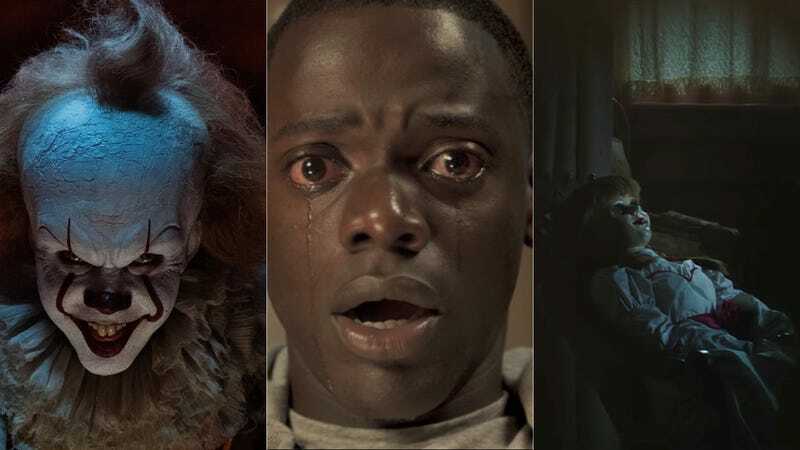 The runaway success of “It” (more than $300 million and counting) and “Get Out” ($175 million) led the way, but October is a golden month for horror and will surely add more to that tally. “Happy Death Day” was No. 1 when it opened this month (on Friday the 13th), and a new entry in the hit “Saw” franchise, “Jigsaw” (due Oct. 27), should also raise the total. Many of the biggest horror films of past decades are movies I will most likely never see—The Exorcist, A Nightmare on Elm Street—because I am easily frightened into weeks of nonsensical nightmares. Something to ponder is just how much the terror that eats at us daily makes us seek comfort in deep psychological fears manufactured on screen, and whether there’s a sort of emotional control that these movies allow as we seek out justice and punishment for people doing terrible things.